Twitter has produced a vibrant ecosystem of third party applications thanks to the release of its API. If you take a look at Twitter app store oneforty, there are thousands of applications and sites that are using Twitter’s various APIs to build useful and innovative applications. Which is why Yahoo Meme, Yahoo’s microblogging tool that hopes to compete against Twitter and Tumblr, is releasing its own API for third party developer use. The problem: Yahoo Meme doesn’t have many users. Yahoo is offering Meme’s open API built on top of the YQL (Yahoo Query Language) platform. The API features compliance with OAuth for access to user data. Yahoo meme lets users post their own content (including text, photos, videos, links and more) and repost the content of others with one-click publishing, allows users to follow other Meme users (via one-way connections, no friend authorization is required) and comment on their posts. Meme’s content limits are higher than Twitter’s—the limit is 2,000 characters. 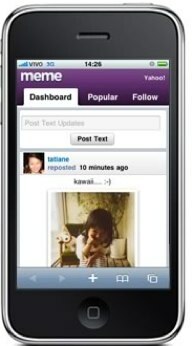 And Yahoo says that they used Meme’s open APIs to build the mobile version of Meme for smartphones. Yahoo also shed some light on where Meme is being used; apparently, Meme is gaining a following in Brazil, China, the Philippines, India and Turkey. 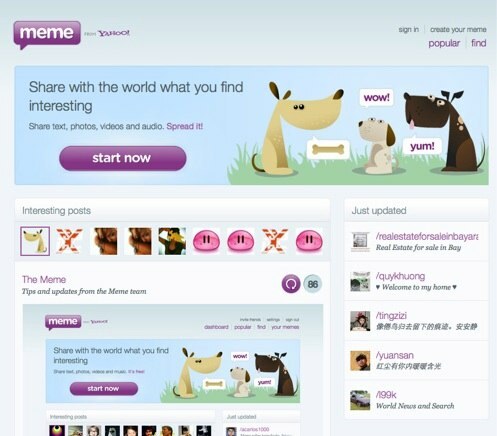 Yahoo initially rolled out Meme in Portuguese, then Spanish and then English most recently. It’s interesting that Yahoo has been relatively quiet about Meme, launching new functionality without much fanfare or press outreach. Perhaps Yahoo wants to see if there is viral usage of Meme before pouring marketing dollars into the product. But microblogging is definitely catching on and Yahoo seems to be trying to figure out what the right model is. SixApart is also a fairly big player trying to enter the microblogging space with the recent launch of TypePad Motion.